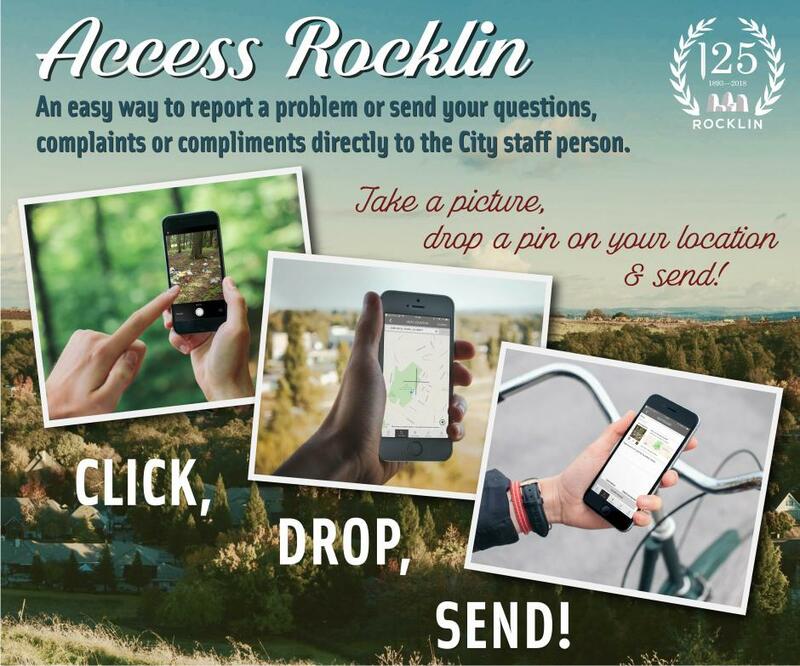 Access Rocklin is an easy way to report a problem, or to send your questions, complaints, and compliments directly to the City staff person. Your submission will be tracked and answered in a timely manner. You can use Access Rocklin from a web browser, or with the Access Rocklin mobile app, available for iOS or Android. Access Rocklin allows residents to file reports to the City of Rocklin on a variety of issues including property maintenance, noise, parking, traffic complaints and much more. City staff will receive requests immediately and users can even check on the status and receive messages about requests as they are processed. Requests can be submitted anonymously or include contact information for the City to follow up. The personal information entered by users to create an Access Rocklin account or to submit requests, like phone numbers or email addresses, will not be shared with anyone outside of authorized City of Rocklin staff. The City of Rocklin offers citizens a simple and easy way to report issues from your iOS or Android device. The Access Rocklin App is available in both iTunes and Google Play.